It was with a mixture of delight and trepidation that I learned a few months back of technology visionary Geoffrey Moore’s new book, Escape Velocity. You see, I’ve been using the phrase for years to describe what I think is a critical requirement in the marketing of new technology — the harnessing of sufficient resources to escape the pull of existing conditions and catapult a product or company into new revenue territory. So my delight lay in having someone like Moore use the same metaphor; my trepidation was that maybe he was using it in the same way. No cause for worry; Moore applies the metaphor in a far more comprehensive, considered and well researched analysis of what companies must do to escape the pull of their past activities so they can better address the challenges of finding new opportunities. I may use the metaphor in a far narrower context but it remains valid nonetheless. Let me explain. Far too often, I have seen technology executives resist making the kind of intensive investment that marketing really requires. They tell me they prefer to go slow, to gradually ramp up marketing activities. Or, even worse, as I’ve written about before, they tell me they’ll increase their spend on marketing just as soon as they have revenue-paying customers, an approach I liken to a driver ridiculously thinking he can fill his gas tank after he arrives at his destination. They can’t afford the programs I tell them they need to implement, they say, so they dribble out marketing dollars in a way that’s doomed to fail. Here’s the thing. Most technology companies face two daunting requirements when bringing a new product to market. The first is that to succeed, they probably have to persuade their target users to change the way they do things. And, as I wrote in my very first post when we re-launched this blog earlier this year, changing human behaviour is devilishly difficult. The second is that they probably have a very narrow and rapidly closing window of market opportunity that will slam shut as soon as the next innovation leapfrogs over them. These two factors put a huge premium on marshalling the right marketing resources at a sufficient level of intensity to get the job done. I call it achieving marketing escape velocity. 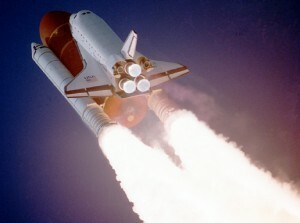 Escape velocity is an engineering term for the speed that an object in flight must achieve to overcome the gravitational pull of a larger object. In its most common usage, it’s the speed a rocket headed into earth orbit or beyond must achieve to overcome the pull of earth’s own gravity. In my admittedly tortured use of the metaphor, products are developed down here on earth while customers and revenue live in orbit. And, just like a space ship requires massive booster rockets to escape the gravitational pull of earth, so, too, a company needs to make a sharp, intensive investment in marketing to get its products in front of customers. Companies fear making that investment. What if it doesn’t work, they ask? I understand that fear. There is no guarantee that even if they do what seems to be required they will achieve marketing success. Rocket ships have been known to explode on the launch pad or to otherwise fail to achieve orbit despite having a properly engineered launch strategy. What I do know is that the alternative, dribbling out marketing dollars in a way that makes no impact on the marketplace and builds no momentum, is doomed to fail. The tragedy is that in the end, many companies end up spending the same amount of money; they just never achieve marketing escape velocity. And the kicker? Just as a spaceship requires far less energy to maintain orbit, a company requires far less effort to sustain a market’s attention having once engaged it. What have you done to achieve marketing escape velocity, to get your product off the launch pad into orbit around your customers? Great article, I suppose the term Escape Velocity is so popular is because it is so appropriate to the marketing and innovation of a new product. Just like a rocket ship, it takes a lot of thrust to get a new product off the ground, but once that product is successful and in orbit, much less effort is required. Getting to the orbit is the tough part, but innovators like Geoffrey Moore are like those NASA scientists creating the rockets that todays businesses need to fly our products to the stars. I’ve been following Geoffrey Moore since Crossing the Chasm and Escape Velocity has proved to be a great read. You can also find out more about the book at Geoffrey Moore’s Escape Velocity Website http://www.escapevelocitybymoore.com or his personal website http://www.geoffreyamoore.com.